The legacy that haunts her . . . The mystery she must solve . . . A man who threatens to reveal her secrets . . . and break her heart. Burned by a failed marriage, former FBI agent Marc Rossi wants back in the investigation game with no emotional strings attached. Taking an assignment for his enterprising Angelino cousins, he heads to Northern Ireland to pry a key piece of evidence from a missing socialite-any way he can. But when the ice queen turns out to be warm, beautiful, and on a secret mission of her own, the job becomes a passionate reminder of what happens when duty and desire mix. Private investigator Vivi Angelino loves living life on the edge, but stepping into the shoes of a movie starlet to bait a serial killer isn't just a thrill . . . it's a ticket to the big time for her fledgling security firm. That is, as long as a certain risk-averse FBI agent stays out of her way-and out of her fantasies. Assistant Special Agent in Charge Colton Lang isn't above using his well-worn rulebook to stop Vivi's latest walk on the wild side. But when they learn her client is involved in something far more insidious than bad acting, Vivi and Colt must work together despite the electrifying attraction arcing between them. For each new clue is bringing them closer to a high-profile crime with a dark and deadly truth at its core . . . and a cold, calculating murderer with nothing left to lose. 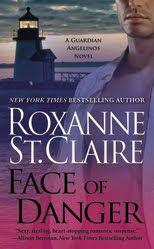 First published in 2003, Roxanne St. Claire is a RITA-award winning author of twenty-five novels, including her bestselling Bullet Catcher series. Her critically-acclaimed books have been published in numerous languages and recognized with multiple awards including The National Reader's Choice Award, the Daphne du Maurier Award and the HOLT Medallion, all for best romantic suspense. She currently lives on the east coast of Florida with her husband and two children. Excerpts, contact information, and free reads are available via her website. If you read the first book, Edge of Sight, you will be happy to carry on reading about the Guardians Angelinos. Though the book starts out introducing you to the new characters in the story, you quickly get to the characters you are familiar with. The new characters are great too, and big happy surprises brings them all together in the end, as usual. I loved the suspense part of the story much more than the budding romance between Marc and Devyn. Though their love story is light, it carries much impact. Definitely a great way to continue the series! I liked that the author went back to the original cast with this book, and brought about another romance with Vivi this time. She is my favorite character in this series, by far, and I was happy the main focus was on her. I really liked the detective part of the story too. An interesting premise, though done before, was done this time with a hint of suspense that was just right for this book. All in all I would recommend this series to any of my lady friends, but would strongly suggest starting at Book 1: Edge of Sight. It flows better that way. Recommend this series? Definitely to my lady friend and followers. And now for the lucky winners who win both books each.